I know, gum isn’t really a “snack” but it is something I consider a snack substitute and according to childhood folklore, it can end up being an 8 year snack if you swallow it. Gum plays such a big part of my life I just felt I had to include it. Although, I haven’t had this particular gum in many years, I felt it was worthy of a taste test. In a perfect world, Chewels and Tidal Wave would still be around and I could include them in this comparison but these are the only two liquid-center gums currently available. This gum is very sweet, the bubble gum flavor is apparent but is kind of masked by the overwhelming sweeteness. The liquid center has a little thickness so it doesn’t just spill out (although normally it shouldn’t matter because it’s in a mouth anyway). The texture is nice and soft and is elastic enough to blow some bubbles, not the best, but okay. I had high hopes for this classic but even though the initial flavor was decent, it only lasts for what seems like only a few seconds. The liquid center is much more gooey and kind of gross. The chew on this is pretty bad, there’s is no elasticity so in under a minute I found myself chewing on a hard, tasteless wad of something that resembled gum. But I guess why would they make two liquid-center gums? I did a little looking online but didn’t really find anything on Bubbaloo so I can’t tell if this is a copy-cat or sister product. I tried it and it looks and tasted like the Bubblicious except that it had better bubble blowing abilities. Hey there – Just wanted to say I think the new blog is a fun idea. I especially love the cheez it / cheez nip graphic lol.. 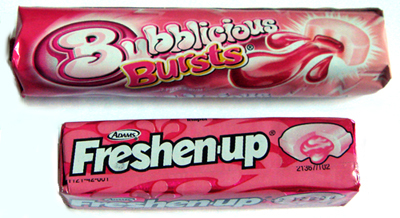 I chewed a lot of Bubbaloo when i lived in Brazil. It’s very good. I would always buy Bubbaloo at the airport in Pakistan and chew it during take-off. It was awesome, so gooey and sweet! (although I was eight years old). With regards to availability, maybe it’s the bubblegum of choice of us tan skinned foreigners. Lucinda and I were JUST talking about Freshen Up gum yesterday! I kept singing the jingle to her while we were in the car, which I’m sure she found endearing. 😉 Anyway, I completely agree with you about the flavor lasting just a few seconds. Love the blog, and hope you have a wonderful birthday today, neighbor!